Did you know that the septic system is probably the most costly component of a home? It can cost up to $30000 to repair. Also, your septic system can impact properties other than your own, possibly contaminating your neighbors' well water. It pays to understand how the system works and to have it examined before purchasing a home. 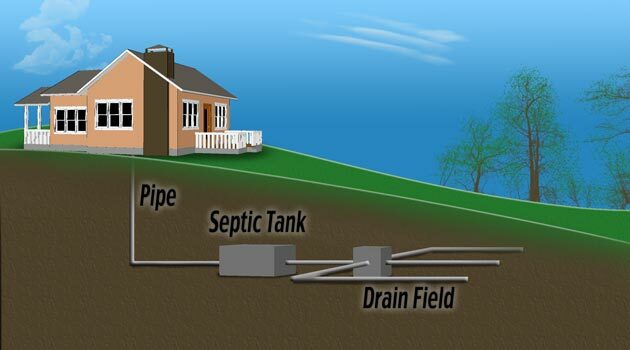 A septic tank is a big underground container, usually about 9 feet long and 6 feet high that is connected to a house's sewer line. Some are built with a 1,000 gallon capacity but the size of the tank is dictated by the number of bedrooms in the home. Septic tanks may be rectangular or cylindrical and can be made of different materials, usually concrete or fiberglass. Waste water from the house (bathrooms, sinks, etc.) flows into the tank where the solids separate from the liquid. Light solids, such as soap suds and fat, float to the top and form the scum layer. The scum remains on top and slowly thickens until the tank is cleaned. Liquid waste flows into the drain or leach field, while the heavy solids sink to the bottom of the tank where they are slowly decomposed by bacteria. Some non-decomposed solids remain, forming the sludge layer that will have to be pumped out. Ask your septic contractor for advice on pumping - usually every two or three years will keep the system in good order. Septic systems have a design life like any other system in the home. Your septic contractor can help estimate how old your system is. Septic failure usually comes in one of two ways: water appears on top of the leach fields (they're full beyond capacity) or water and waste backs out of the tank, through the waste pipe, back into the house. 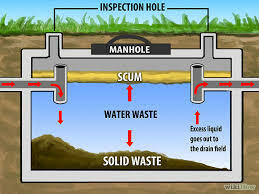 Septic tanks should be inspected and cleaned regularly. If you have a large family, an older septic system or a food disposal (not recommended), more frequent cleaning of the tank is advised. Two or three years is the average interval. Solids, which settle down to the bottom of the tank, are broken down by bacteria. Eventually the remaining undigested material known as “sludge,” accumulates and must be removed. If solids are not pumped out regularly they build up to a high level and can be carried from the tank to the absorption field. Those solids clog the pipes, stone and the soil surrounding them. For the last thirty years Connecticut Public Health Code Regulations require that new septic tanks have a minimum of 1,000 gallons capacity and 1,250 gallons if a garbage disposal is installed. 1,250 – 1,500 gallon tanks are common for a four to five bedroom home. At a use rate of 60 gallons per person per day, considered average by most plumbers, a family of five uses 109,500 gallons of water a year. If the number of persons in the home exceeds the average for that size dwelling (five people for a three bedroom house, for example), or is the septic tank is smaller than what state regulations now require, the system should be cleaned every two years until experience indicates a longer period can be allowed. If you are buying a home with a septic tank you need to have it inspected by a professional septic contractor. To properly inspect the system, the contractor will need to dig holes to access the underground parts of the system. This will include inspecting the tank, as well as the leach field. I don't recommend the "dye test" - you'll actually want an expert to open it up and inspect it visually rather than flushing dye down the toilet. It can't be properly evaluated any other way. Repairing or replacing the system is a major expense, best to have it thoroughly inspected before purchasing the home. It makes good sense to have the tank pumped during or after evaluation, but do not have it or let it be pumped before it is inspected. A professional septic contractor can perform both the inspection and pump the tank at the same time, killing two birds with one stone and assuring that you begin with an empty tank and a system that has been inspected. Often, you can negotiate with the seller to have them pay for the pumping.